Jasmine rice is known as Thai fragrant rice. It is originally from Thailand. 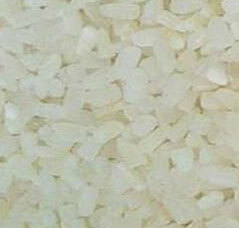 Jasmine rice has a subtle sweet taste, delicate jasmine aroma and slightly sticky texture. To harvest jasmine rice, the long stalks are cut and threshed. 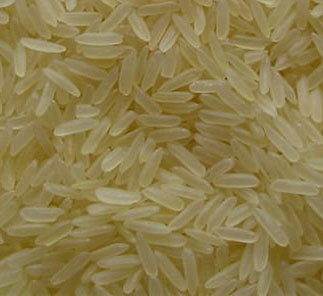 The rice can then be left in a hulled form and sold as brown rice or shucked and sold as white rice. Most Southeast Asians prefer the white variety of jasmine rice. Brown rice is whole grain rice. It has a mild, nutty flavour, and is chewier and more nutritious than white rice. The process that produces brown rice removes only the outermost layer, the hull, of the rice kernel and is the least damaging to its nutritional value. The complete milling and polishing that converts brown rice into white rice destroys 67% of the vitamin B3, 80% of the vitamin B1, 90% of the vitamin B6, half of the manganese, half of the phosphorus, 60% of the iron, and all of the dietary fiber and essential fatty acids. Fully milled and polished white rice is required to be “enriched” with vitamins B1, B3 and iron. Parboiled rice is rice that has been partially boiled in the husk and soaked, steamed, and dried before milling to improve the cooking quality, retain the water-soluble vitamins, and reduce the breakage in milling. The parboil process causes a gelatinisation of the starch in the grains. The grains become less brittle, and the colour of the milled grain changes from white to yellow. The rice is then dried, and can then be milled as usual or used as brown rice. Milled parboiled rice is nutritionally superior to standard milled rice (other than its vitamin-B content, which is denatured). These processes also make rice easier to process by hand but changes the texture. Parboiled rice has an additional benefit in that it does not stick to the pan during cooking, as happens when cooking regular white rice. This type of rice is eaten in parts of India and countries of West Africa are also accustomed to consuming parboiled rice. About 50% of the world’s paddy production is parboiled . The treatment is practiced in many parts of the world such as India, Bangladesh, Pakistan, Myanmar, Malaysia, Nepal, Sri Lanka, Guinea, South Africa, Italy, Spain, Thailand, Switzerland, USA and France. Parboiling drives nutrients, especially thiamine, from the bran to endosperm, hence parboiled white rice is 80% nutritionally similar to brown rice. Broken rice is a grade of rice consisting of grains broken in the milling process. The grade and the quality vary from country to country and individual mills. This can be any percentage of broken usually to West Africa, we at Platinum Global, export 100 percent broken of jasmine, white rice or at times brown rice. Our grain size of the broken rice is far superior to most brands in the market. 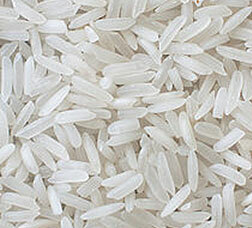 Rice is the staple food of over half the world’s population. It is the predominant dietary energy source for 17 countries in Asia and the Pacific, 9 countries in North and South America and 8 countries in Africa. Rice provides 20% of the world’s dietary energy supply, while wheat supplies 19% and maize (corn) 5%. A detailed analysis of nutrient content of rice suggests that the nutrition value of rice varies based on a number of factors. It depends on the strain of rice, that is between white, brown, black, red and purple varieties of rice – each prevalent in different parts of the world. It also depends on nutrient quality of the soil rice is grown in, whether and how the rice is polished or processed, the manner it is enriched, and how it is prepared before consumption. An illustrative comparison between white and brown rice of protein quality, mineral and vitamin quality, carbohydrate and fat quality suggests that neither is a complete nutrition source. Between the two, there is a significant difference in fibre content and minor differences in other nutrients. Brilliantly coloured rice strains such as the purple rice derives its colour from anthocyanins and tocols. Scientific studies suggest that these colour pigments have antioxidant properties that may be useful to human health. In purple rice bran, hydrophilic antioxidants are in greater quantity and have higher free radical scavenging activity than lipophilic antioxidants. Anthocyanins and γ-tocols in purple rice are largely located in the inner portion of purple rice bran. Comparative nutrition studies on red, black and white varieties of rice suggest that pigments in red and black rice varieties may offer nutrition benefits. Red or black rice consumption was found to reduce or retard the progression of atherosclerotic plaque development, induced by dietary cholesterol, in mammals. White rice consumption offered no similar benefits, and the study claims this to be due to absent antioxidants in red and black varieties of rice. 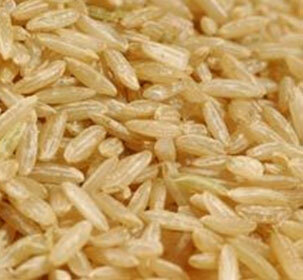 Eg; indian Rice, white, long-grain, cooked, amount per 100 grams.